Customize the look of your websites scroll bar! And enable smooth scrolling of your websites content! Styled Scroll Bar gives you virtually all of the styling and configuration options available in the NiceScroll.js library, all from the convienience of your Concrete5 dashboard panel. After installing this add-on, you will have complete control over how your websites scroll bar looks, from its size to colors, to how fast your content scrolls. Additionally you will be able to configure things like smooth scrolling, touch events, and whether to hide the scroll bar or not when the user is not scrolling content. Its a great plugin to add that finishing touch to your Concrete5 website. Make your scrollbar match the design of your website by using the built in color pickers from the dashboard page. Styled Scroll Bar not only lets you change the look and feel of your websites scrollbar, but it also enables smooth scrolling of your websites content to provide the best user experience ever. You can decide how fast or slow the scrolling takes place, as well as how much content gets scrolled with each turn of the mouse. The add-on installs with preset configuration that will work right out the box. Theres over 40 configuration options available from the dashboard. Super Scroll Bar will start working right away with no configuration by you. 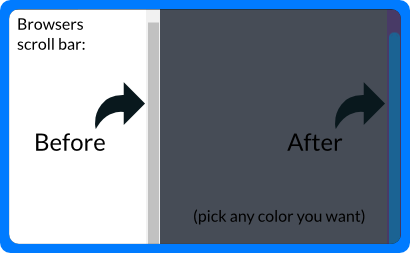 Just change the colors and size of your scollbar to personalize it for your website. Works great along side our 'Smooth Link Scrolling' plugin.